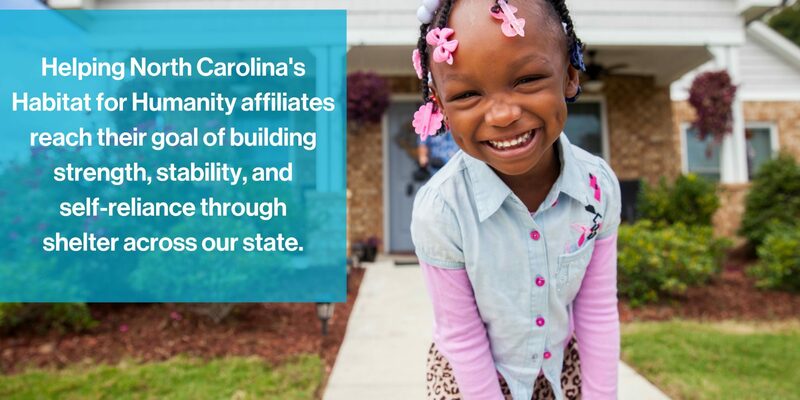 Your gift will help Habitat for Humanity provide more affordable housing opportunities within North Carolina. The 67 Habitat for Humanity affiliates have built more than 7,600 new homes for low-income families in need within this state. With rehabs and critical repair, we have served more than 10,000 families. However, there is much more to be done and the need for affordable housing continues to increase as the population within North Carolina grows. You can donate in the following ways: Online Giving – Monthly gifts can be scheduled to automatically come to us, or you can make a one-time contribution. Planned Gifts: Create your legacy through a planned gift to Habitat for Humanity. Employer Matching Gifts: Many employers will match their employees’ donations. Check to see if yours matches.